Welcome to the Honolulu Sailor's Home! The Honolulu Sailor's Home is a non-profit lodge for merchant seamen. The home was incorporated in May 1855 with a lot obtained by a grant from the Kingdom of Hawaii. We have just recently completed a major renovation! Please feel free to take a tour of our accomodations. We are now accepting retired seamen to lodge here for a duration of up to 3 months at any one time (with certain limitations). Please email or call for details. 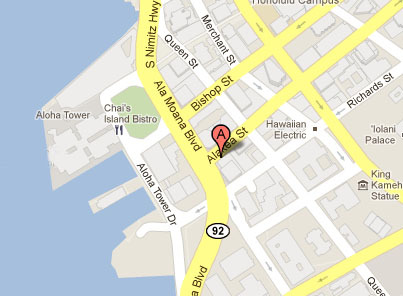 We are located in Downtown Honolulu on the island of Oahu. We are just a few miles away from the Honolulu International Airport. We are centrally located and major attractions are just minutes away via walking or riding TheBus. With our Award Winning public transportation system, TheBus, you can easily get around all of Oahu.